Spring - the season of new beginnings - marked by its fresh blossoms and renewed life after the harsh winters - offers devotees of Yogoda Satsanga Society of India an equally promising opportunity to immerse again in the sacred, soul-liberating Kriya Yoga teachings of Gurudeva Sri Sri Paramahansa Yogananda with renewed zeal at its Noida Ashram. It organizes two five-day sangams during this season. The first of the two consecutive sangams - Sangam I - was conducted from March 13 to 17, 2019. The ashram hosted over 330 devotees, while 70 others used to come from their homes and attended the programmes. 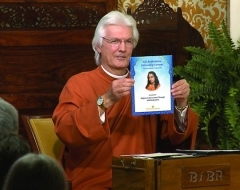 The five days of Sangam included reviews of the Yogoda meditation techniques and energization exercises, satsangas by YSS sannyasis, group meditations, kirtan sessions, video shows, spiritual counselling by the sannyasis, and Kriya Yoga diksha (initiation). 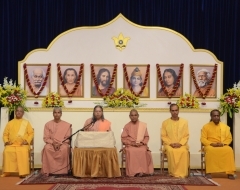 The sangam opened with a spiritual programme which included kirtans by devotees, an opening prayer by Swami Lalitananda, a welcome message by Swami Vasudevananda and an opening satsanga by Swami Smaranananda. In his welcome message, Swami Vasudevananda encouraged devotees to immerse themselves in meditation and devotion to draw the maximum benefits from their sangam stay at the ashram. Swami Smaranananda reminded the attendees of the significance of exercise in their lives, and offered some advice on how to include physical exercise in the modern sedentary way of living which is saturated with gadgets of convenience. He reminded the sangam participants of the value of energization exercises as a pillar of our sadhana. In the next session of the day, Brahmachari Sheelananda conducted a review of Energization Exercises, which was continued on the second day as well. On the second day, Brahmachari Gyanananda took a class on the Hong-Sau technique of meditation. It was followed by a satsanga by Swami Vasudevananda on the topic: 'The Healing Power of Forgiveness' who narrated several anecdotes that expressed this divine quality among the great ones like Jesus Christ, Sant Eknath, Lord Vishnu and Yudhishthira. Forgiveness and humility make a man great, he shared, quoting Shloka 3 of Chapter 9 of the Bhagavad Gita that describes the three qualities - the radiance of character, forgiveness and patience, which mark the divine inclination of a person. Anyone not possessing these can never forgive. The spirit of forgiveness arises from the long practice of spiritual discipline and humility. Each day offered the spiritual gathering to immerse in group meditation in three sessions led by sannyasis - morning, noon and evening. The evening session on this day included a video show. Resplendent with the colours of spring in the month of March, the ashram gardens invited devotees to sit and meditate in the sunshine during their spare time in between classes. On the third day, Swami Lalitananda gave a satsanga on the topic: 'Living in the Present Moment.' He quoted Gurudeva, "Live each present moment completely and the future will take care of itself. Fully enjoy the wonder and beauty of each instant. Practice the presence of peace.” We are dragged into the past owing to incidents where we either feel guilt, or ascribe the responsibility to others, or put the blame on circumstances. The resolution, he said, was to overcome this by spiritual practice that helps us to forget the past. The Aum technique was reviewed by Swami Vasudevananda in the morning session. Brahmachari Sheelananda gave a satsanga on the topic: 'Affirmation: A Tool for Spiritual Transformation.' Affirmation, he said, was nothing but the truth that is repeated continuously, a process prescribed by Guruji. During the process of affirmation, we have to be fully convinced of the truth and repeatedly affirm it with a positive feeling. In the evening, during the kirtan session by Swami Vasudevananda where he serenaded Divine Gurudeva, and divinity in all forms, devotion and bliss were palpable in the attendees who participated in the chanting session with enthusiasm. The session also included a few Cosmic Chants of Gurudeva. In his satsanga, Swami Lalitananda said that the very mention of Guruji, the premavatar, and His words, “Only love can take my place”, expounds the ‘power of divine love’ - the theme for the discourse. He said that divine love not only has effects on the mind but also on the body, as many defects and diseases get eliminated. Swami Smaranananda gave a satsanga on the topic: 'The Principles of Effective Prayer.' He guided devotees to approach prayers with the right attitude. When God grants a prayer, it increases our faith in Him; when there is a delay, it increases our patience; and, when a prayer is denied, He knows that you can handle it. The most appropriate time for effective prayer is after meditation. All our legitimate prayers are going to be answered; we have to but approach as a child and not as a beggar. Many devotees availed of valuable spiritual counsel and review during the counselling by YSS sannyasis. In the afternoon session, Swami Vasudevananda reviewed the queries received during the sangam in the 'Question and Answer' session. On the morning of the final day of the sangam, Swami Ishwarananda conducted the sacred Kriya Diksha initiation ceremony in the pandal, where more than 40 devotees received the technique. Around 600 Kriyaban devotees attended the ceremony. It was followed by pushpanjali and the serving of Kriya Prasad to all the participants. Simultaneously, Brahmachari Gyanananda gave a satsanga for non-Kriyabans in the Dhyana Mandir. In the afternoon session, a review of Kriya Yoga technique was conducted by Swami Lalitananda. 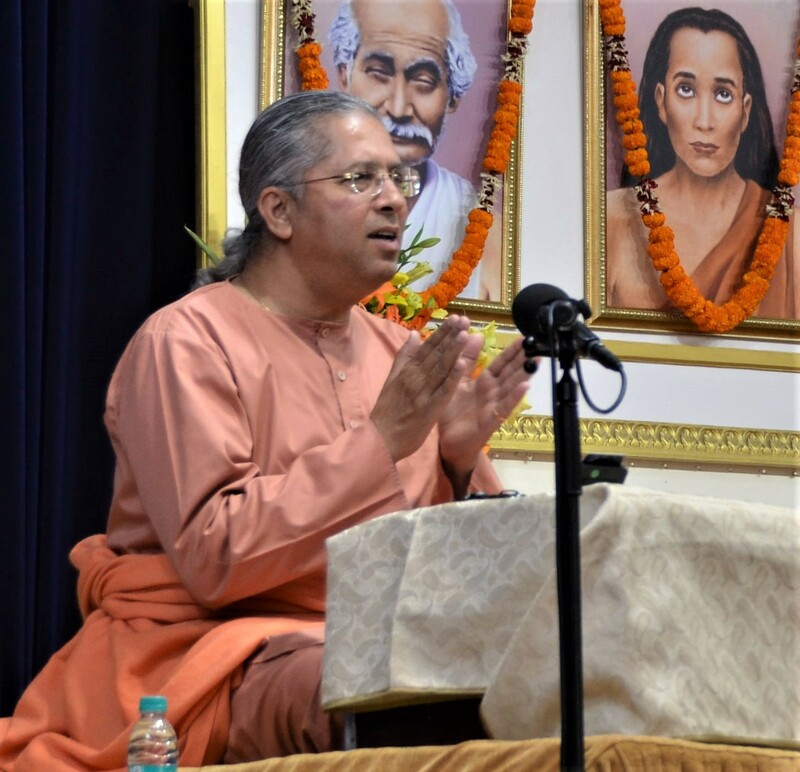 During the closing programme, Swami Smaranananda gave a satsanga in which he spoke about the significance of meditating regularly with devotion, faith, surrender and patience. Swami Vasudevananda thanked the devotees for their joyous participation in the sangam and offered his gratitude to the volunteers who worked selflessly to facilitate the programme. As the devotees stepped out of the pandal after the evening meditation, they were welcomed by a sight to behold. The facade of the ashram buildings, as well as its beautiful gardens, were lit up with tiny electric lights and glass lamps with candles that shone in all shades. Spiritual discourses given by monastics inspired devotees to reflect on various facets of their spiritual journey and make fresh efforts with renewed enthusiasm. Devotees who took part in this sacred gathering shared that the review classes, especially the Kriya ceremony, reminded them of key points in the practice of YSS meditation techniques. The first sangam of this year at YSS Noida Ashram brought forth overwhelming joy and profound blessings of the Great Ones - through these five days. 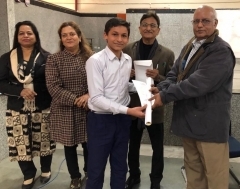 To view glimpses from these five days of Noida Sangam I, click here.